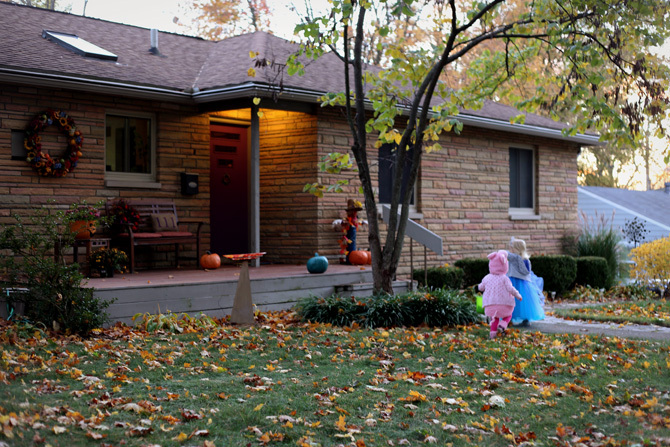 So in the spirit of you can't choose what your kids like: let's discuss costumes. 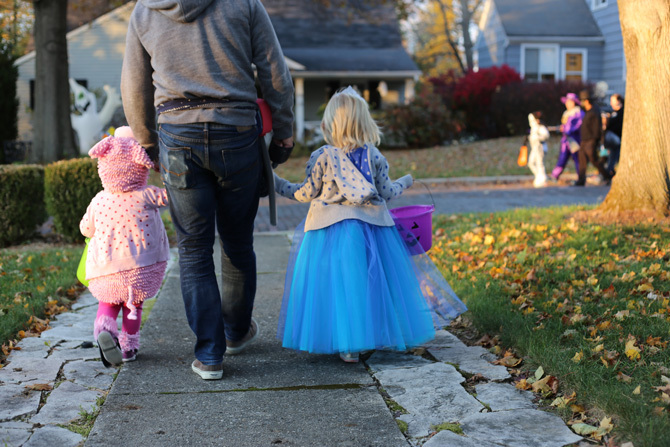 You know I'd love for my kids to enjoy dressing up but I can't force it. I can maybe force them into the costumes, but it involves so much weeping and gnashing of teeth that it's just not worth it. But I really do love seeing them dressed up, so I've been trying to get them to embrace the idea. In years prior, I've had full reign over what the kids wear. 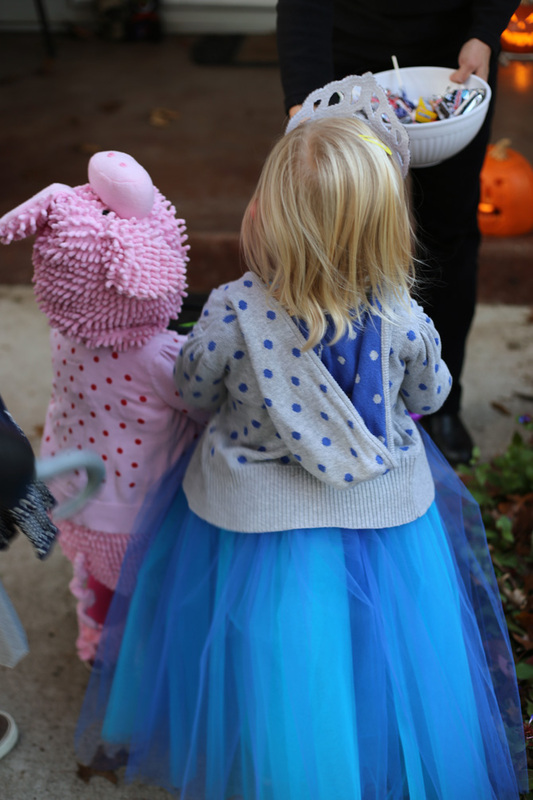 When they're babies they get no say in the matter, but even last year I chose what I wanted, successfully getting them to dress as nesting dolls and Daniel Tiger/Katerina Kitty Cat. I wondered when I'd have to succumb to their tastes, and let them choose their own costumes...And it seems like the answer is: now. 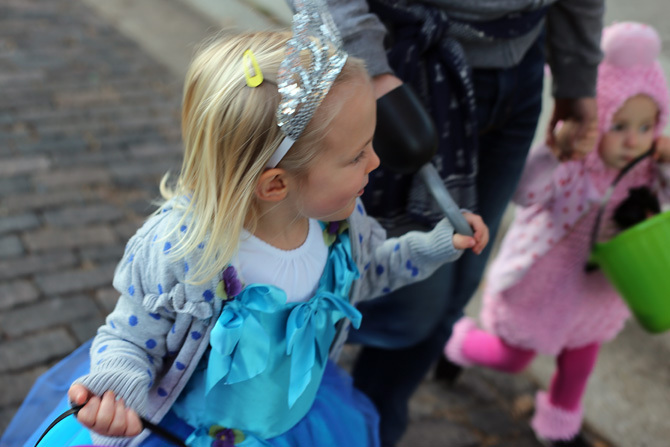 When I asked Piper what she wanted to be, she answered quickly and confidently: "A beautiful queen!" O....kay.... Now, if you know me, you know I'm not a fan of the whole princess/glitter/pink-explosion that comes along with having daughters. I realize it's somewhat inevitable, but I was hoping to hold off for a while, or at least rein it in a little. So of course I've gotten two daughters who can't get enough dolls or ponies, or purple or glitter, and beg to read Pinkalicious every single night. Whatchagonnado? So I set off to Once Upon a Child to find something fit for a beautiful queen, and hoped something would inspire me for Fin. Typically for costumes I like going the semi-homemade route. I buy certain pieces, but then make the rest, or cobble together things we already own or will be able to use later. This year though, I hit the second-hand jackpot, and ended up with no less than six adorable ensembles, all $5-$10 a piece. That made things really easy...now all I had to do was convince three children to wear them! Well, it turns out we have one little girl who follows in her mama's footsteps, and one who has inherited her daddy's sartorial skepticism. The minute I showed Piper her princess dress she ooooooh'ed and ahhhhhhhh'ed and begged to wear it pretty much every day. 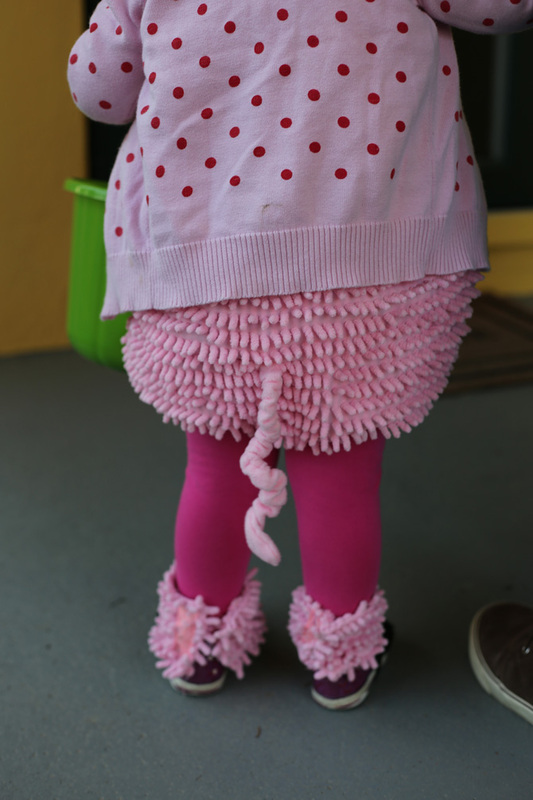 She was thrilled to tell everyone about her costume, and would drag visitors up to her bedroom just to see it. And Fin? Well, she couldn't wait to see what I got her, and squealed (costume pun!) with delight when she saw the piggy outfit I found. 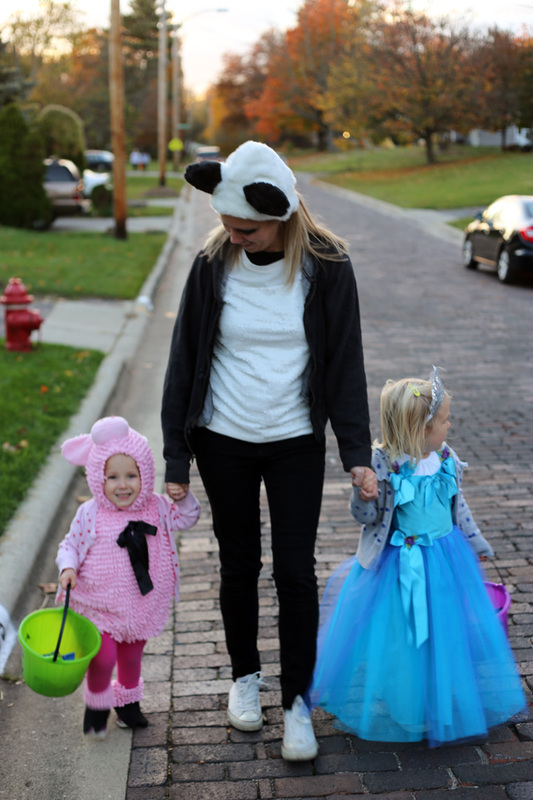 So clearly I'm feeling like #1 mom nailing this whole Halloween thing. But then....I asked her to try it on. Nooooooooooooooooo. 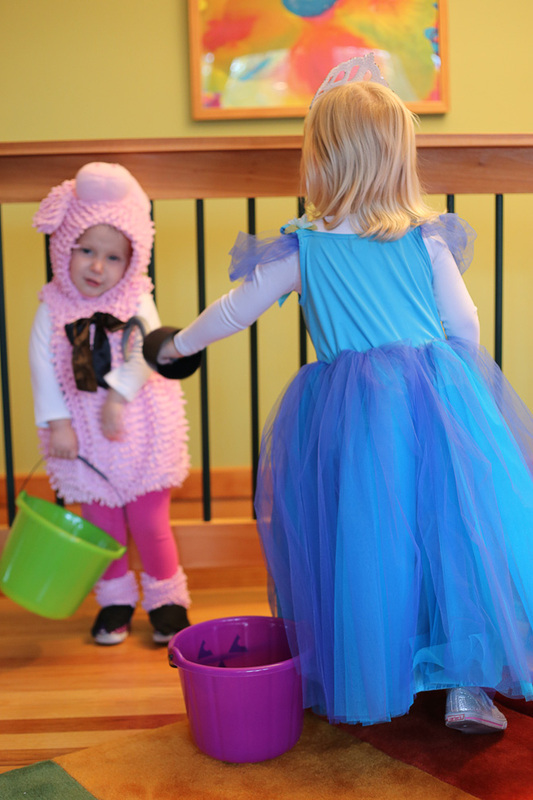 You would have thought I was asking her to walk it to the costume slaughter house. Adamant refusal. But heaven forbid I try to hold it, or suggest we take it back. No no no. 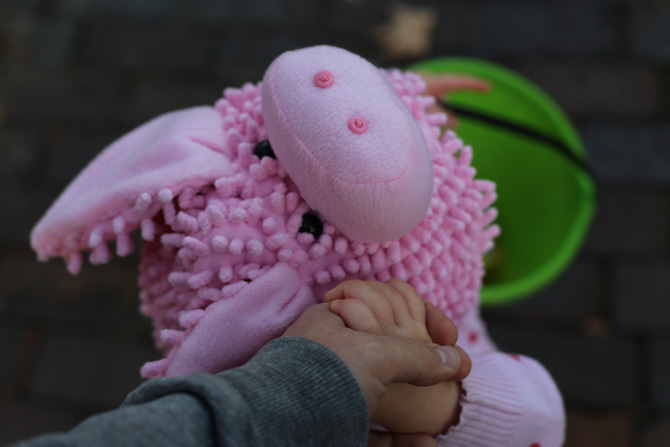 It was HER piggy, and she would wail if it was out of her arms. And so she carried it around for the better part of a month, sleeping with the stuffed head, and pushing it around in her stroller. Weirdo. 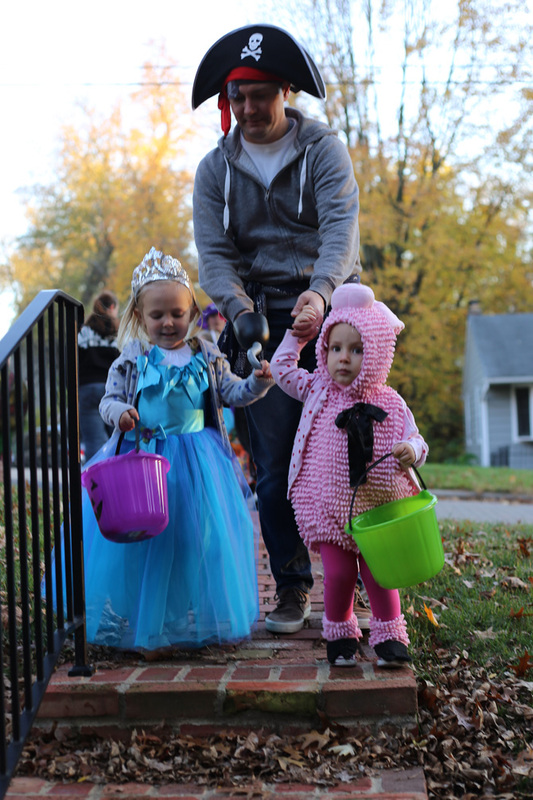 We had chats for weeks about how if you want candy you have to dress up, but she still refused to even step foot in the suit, so I resigned myself to trick-or-treating with one princess, and one little girl dragging a pig along with her candy bucket. 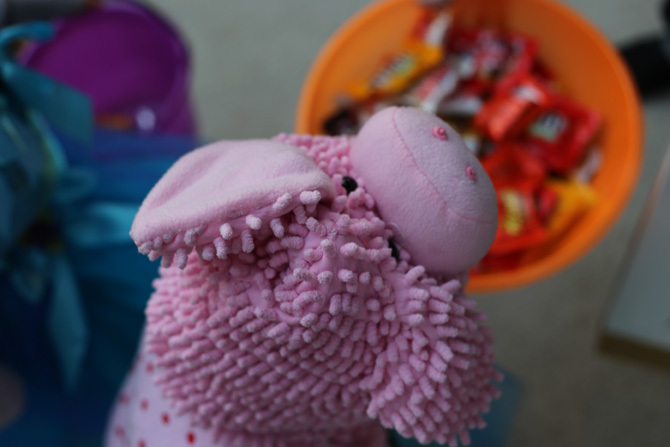 I even joked that I was going to dress her as a butcher, so the severed pig head would at least make sense. 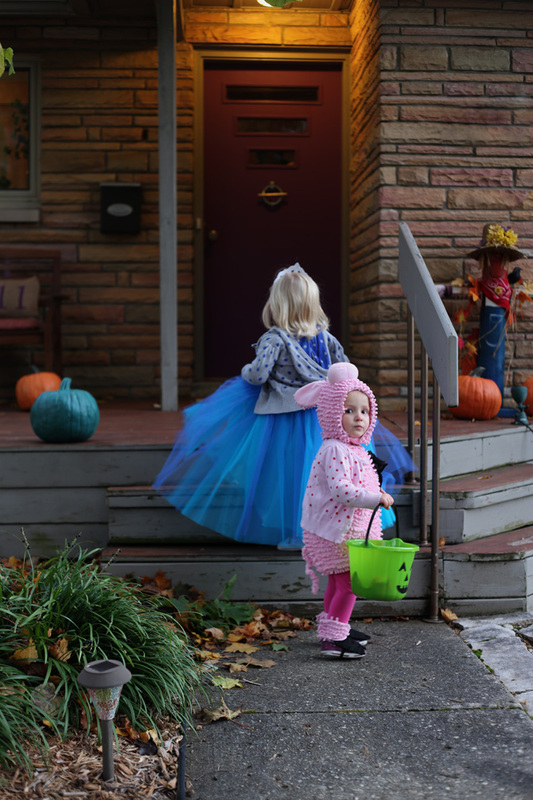 But somehow, in that kids don't make any sense kind of way, when it was time to get dressed for trick or treat, she could not have been MORE thrilled to put on a costume. She beamed from ear to ear, repeating MY PIGGY! I A PIGGY! over and over, and couldn't wait to get all dressed up. She even left the dinner table early and started stripping off her clothes in order to get into it sooner. But I know to take a win when I get one, so I praised both of them endlessly about how amazing they looked, hoping to cement the opinion that dressing up is THE BEST. We'll see if it sticks, but for now, they're believers. We got a couple snapshots inside, and then put on the traditional outfit-ruining outerlayers (because: Ohio...) before posing for a few more pictures as a group outside. Seriously...could they be more excited? Or cute? 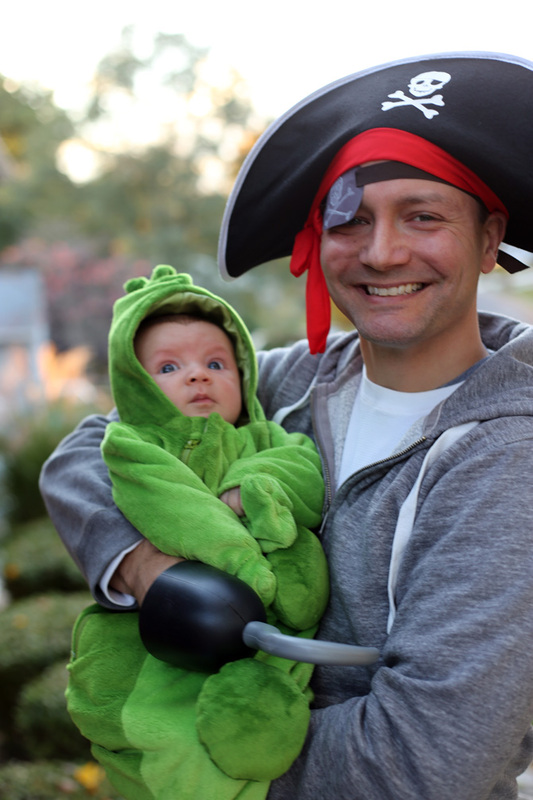 But yes, you heard that right: I got my costume curmudgeon of a husband to dress up for the occasion. 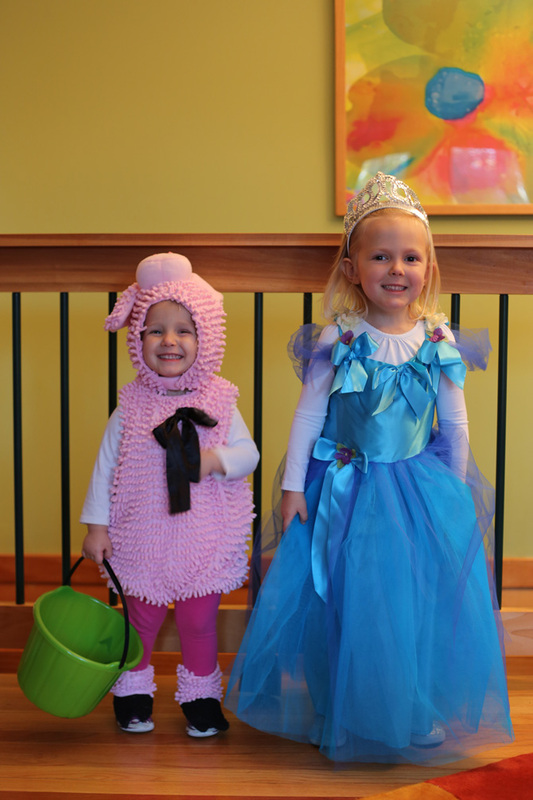 I didn't originally think we'd all dress up, after all, a princess and a pig aren't exactly a cohesive pair...but I had a pea pod outfit for Miller (princess and the pea! And a pig...?) so I thought it would be fun if we all dressed as P things. 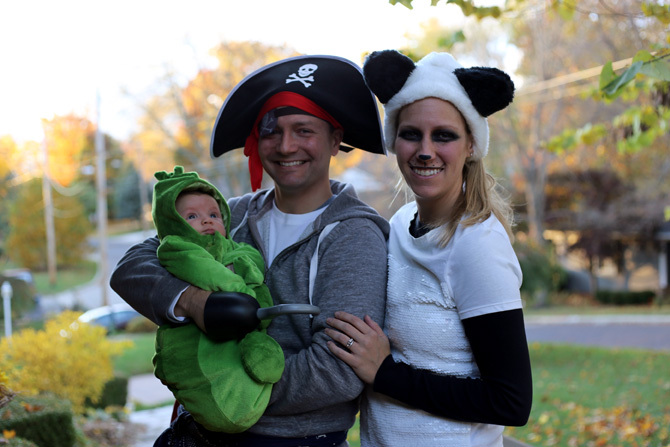 I had a panda hat already (which my mom made when I was a toddler. vintage adorableness!) so I figured he could easily be a pirate (since he missed his chance earlier this Fall). I had a bandanna and an eye patch ready for him, hoping that was low-key enough to get him to cooperate (plus he got to carry a sword! who can be mad at that?) But my mom had a hat and a hook (because of course she did. I didn't get my costume love from nowhere!) which he was surprisingly willing to put on. And so we were set. 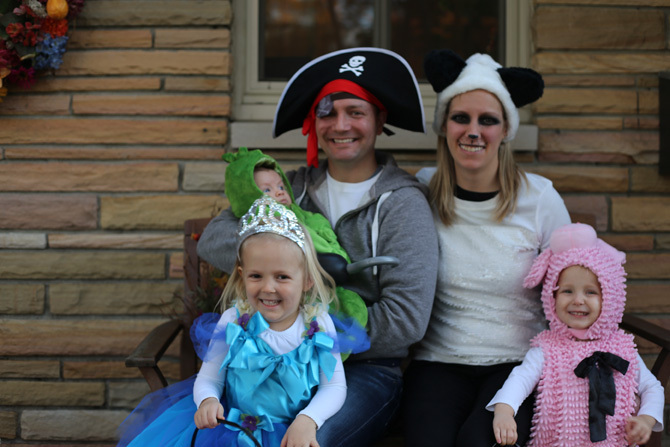 The pirate, the panda, the princess, the piggy, and the pea. Polka dotted sweaters managed to keep them warm without totally killing their costume vibes. They were so excited to go to each house, and did such a good job. I had to hold Piper's dress up the whole time so she didn't trip over the steps, but other than that it was smooth sailing. 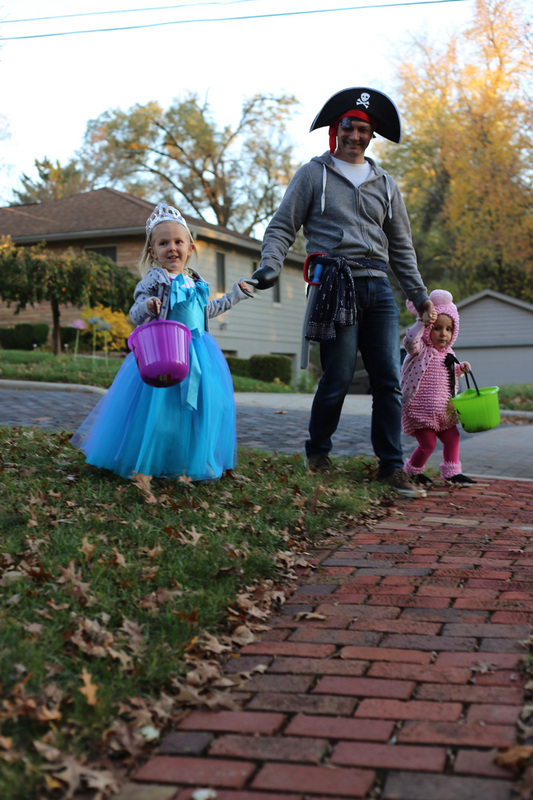 No whining about the cold, no begging to eat candy...(ok, maybe a little of both) just happily strolling from house to house, repeating "Twick or Tweat", and "Shank you!" 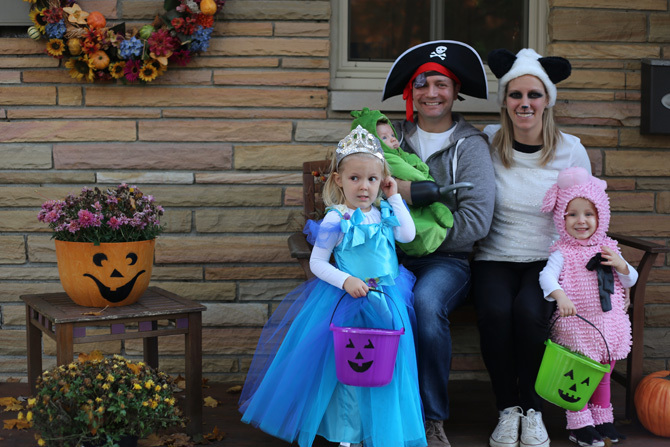 They even managed to hold it together when we saw a feisty little dog wearing a cone turned flashlight costume. We made it back before dark, (seriously...a half hour was just about perfect for all of us) and they excitedly showed off their haul to my parents before eating themselves silly. Our neighborhood's trick or treat is on Saturday, and we've got one more round of costumes, so we'll see if Fin is as excited for that outing. 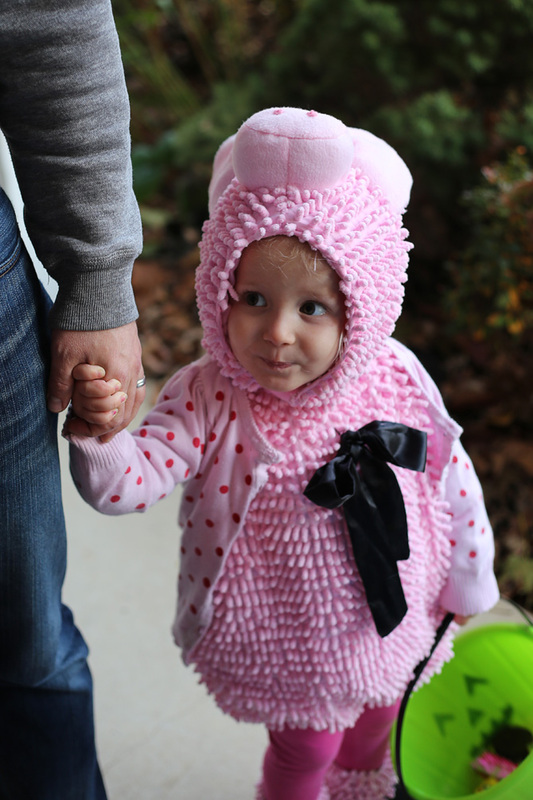 Something tells me as long as there's the promise of more candy, she'll do just fine.